This just hit my RSS reader. It's cruel and unusual punishment and it needs to stop. Now. I can hardly read what was written in those speech bubbles. 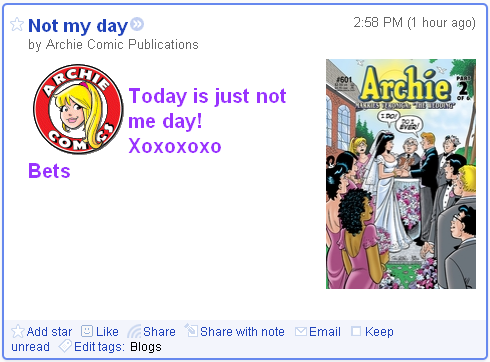 Betty is being taunted by Archie's wedding to Veronica. It's all so wrong! I would like to know, of the two, Veronica and Betty, who is the most intelligent? I have never read an Archie comic in my life. I just never got the appeal and I have read a lot of comics. Betty, also she's somewhat prettier, and easier to get to know.